State Department's Mark Toner denounces reported Russian sale of Sukhoi-30 jets to Iran. The Obama administration said on Thursday that a proposed Russian sale of fighter jets to Iran would violate a UN arms embargo on Tehran, The Associated Press (AP) reports. State Department spokesman Mark Toner said that transferring the Sukhoi-30 jets, comparable to American F-15E fighter bombers, requires the UN Security Council's approval. The comments come after reports in Russia on Wednesday that Iran is on the verge of signing a massive arms deal with Russia. According to the reports the sale, which would exceed $8 billion, would provide Iran with anti-ship missile systems, a fleet of new submarines, military helicopters, and advanced trainer aircraft for its air force. In his remarks on Thursday, Toner said that the U.S will raise the matter of the sale with Russia, adding that all six countries that negotiated July's landmark nuclear agreement with Iran "should be fully aware of these restrictions." The deal kept the arms ban on Iran in place for up to another five years. The reports of the massive arms deal followed reports that a shipment of the Russian S-300 missile defense systems is currently on its way to Iran and could be delivered this week. Russia later denied this, saying Iran has yet to pay for the shipment. The dispute is the latest linked to the nuclear negotiations that ended in a deal setting long-term limits on Iran's uranium and plutonium programs in exchange for hundreds of billions of dollars in future sanctions relief. The U.S. and its negotiating partners reached an understanding with Iran to phase out UN bans on Iranian weapons deals and ballistic missiles work after periods of good behavior. Both embargoes are still in effect, noted AP, though U.S. officials say Iran has conducted at least two ballistic missile tests since last summer. In response, Washington imposed new sanctions on Iran. As with the ballistic missiles, U.S. officials say the Russian plane sale wouldn't constitute a nuclear deal breach but would amount to another in a long string of Iranian transgressions of UN Security Council resolutions. 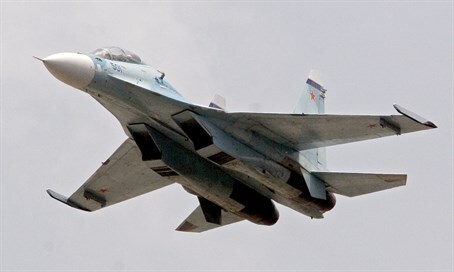 Toner said the Sukhoi qualifies as "combat aircraft" under the UN register of conventional arms. Sales of these to Iran require the Security Council's approval "in advance on a case-by-case basis," he was quoted as having said.